At Guitar World, in the build up to Black Friday and Cyber Monday and throughout the Holiday season, we'll be bringing you the best deals on guitar gear of all kinds. Aside from releasing a great new record, Living the Dream, with Myles Kennedy and the Conspirators and touring the world with Guns N' Roses, Slash has also released a number of signature guitars in 2018. 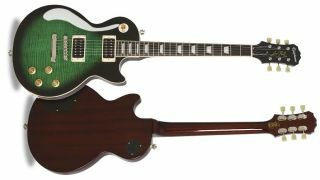 Now, thanks to Sam Ash, you can grab one of them, the Epiphone Slash Les Paul Standard Plus Top Pro, for $699, $100 off its usual asking price of $799. The guitar features an AAA flame maple veneer, finished in a Slash-exclusive Anaconda Burst, plus a pair of Seymour Duncan ‘Slash’ Alnico II Pro humbuckers.